Rain Thomas is a mess. Seven years an addict and three difficult years clean. Racked by guilt for the baby she gave up for adoption when she was sixteen. Still grieving for the boy’s father who died in Iraq. Alone, discarded by her family, with only the damaged members of her narcotics anonymous meetings as friends. Them, and the voices in her head. One morning, on the way to a much-needed job interview, she borrows reading glasses to review her resume. There is a small crack in one lens and through that damaged slice of glass she sees a young boy go running down the aisle of the subway train. Is he screaming with laughter or just screaming? When she tries to find the boy he’s gone and no one has seen him. The day spins out of control. Rain loses whole chunks of time. The voices she hears are telling her horrible things. And Doctor Nine, a spectral boogey man conjured in drug induced hallucinogens is now hunting her in the real world. And Doctor Nine is also chasing that boy. A boy who looks so much like Rain’s dead boyfriend. Unsure whether she is insane or if the world itself is broken, Rain begins a mother’s quest for her lost child through a world where reality and nightmare are in head-on collision. How far will one person go to save someone they love? GLIMPSE –a standalone novel of weird suspense. March 27, 2018. Maberry, known for such sf/horror fare as the Joe Ledger novels and the one-two zombie punch of Dead of Night (2011) and Fall of Night (2014), steps a bit outside his comfort zone with this psychological/supernatural thriller. Rain Thomas, a recovering drug addict, seems to be missing a day: she went to sleep Thursday night and woke up on Saturday. But this is no garden-variety blackout. After she awakens, but before she becomes aware of the missing time, she experiences what she can only assume is a dream: images of a small boy being chased by a threatening . . . something. Later, as Rain tries to figure out how she could be missing an entire day, she is shocked to discover that a figure from her previous life, the drug-induced hallucination she called Doctor Nine, has somehow manifested himself and is chasing the boy Rain had seen in her dream—a boy who, Rain now realizes, bears an uncanny resemblance to her former boyfriend, who was the father of the baby she put up for adoption 10 years ago. As reality and illusion collide, Rain must decide how far she is prepared to go to save the boy and herself. Maberry’s narrative skills remain first-rate here, and his writing displays more subtlety and greater structural elegance than in past works. A success on all fronts. 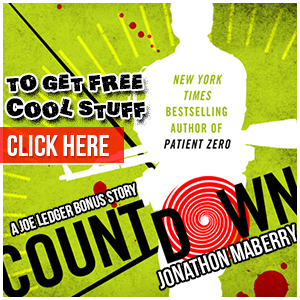 “Jonathan Maberry is a shapeshifter of a writer, able to get into his characters so deeply that we never doubt his truth for a minute.” –Charlaine Harris, #1 NY Times bestselling author of the SOOKIE STACKHOUSE series. 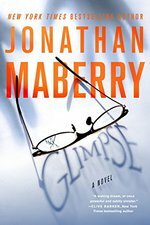 “With Glimpse, Jonathan Maberry carries us into the fertile liminal zone between waking and dreaming. Monsters dwell there, but so do some unexpected heroes, and none is more unexpected than the tragically damaged Rain Thomas. Rain has been living her life just one small drop of hope away from hopelessness, yet it’s upon her slender and storm-tossed frame that Maberry hangs the fate of his world. She’s a poignant creation, and it’s impossible not to root for her as she makes her way through this wonderful (and wonder-filled) nightmare of a book.” –Scott Smith, New York Times bestselling author of THE RUINS and A SIMPLE PLAN. For more reviews, go here!